Enjoy the look of wicker without the risk of weather damage. The Wellington Tall Patio Planter is constructed from 100% polyethylene which delivers an amazingly realistic, incredibly strong and remarkably lightweight planter. The weather-proof and ultra-tough construction allow you to enjoy your planter all year long with very little winter preparation. The UV inhibitors within the resin allow for long-lasting fade-free performance. 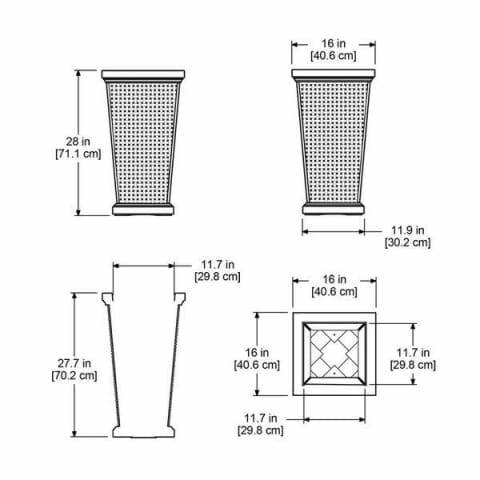 The Wellington Tall Planter creates a charming accent for any outdoor space. Wherever you choose to display this stunning Planter, you will love showing off your favorite flowers in the Wellington Tall Patio Planter year after year.